Ford introduced a redesigned Focus, shown, last year. DETROIT (Bloomberg) -- Ford Motor Co. and Toyota Motor Corp. are each claiming to produce the best-selling car in the world in the first half. The definitions are the key. The Focus was the world's top-selling "single-car nameplate" -- a vehicle sold under only one name -- with 489,616 sales in 2012's first six months, topping Corolla's 462,187, Ford said in statement that cited researcher IHS Automotive. But that criterion excluded more than 100,000 sales of models that Toyota typically counts, such as the Corolla Verso wagon sold in Japan, IHS said. Toyota said its first-half Corolla sales total is 603,840, including Corolla derivatives such as the wagon sold in the U.S. as the Matrix. Auto companies use sales supremacy as a marketing tool to attract buyers. Ford CEO Alan Mulally has set a goal to boost global sales by 50 percent to 8 million vehicles by 2015. That goal has come under pressure as growth has slowed in China and the European market has declined to its lowest level in 17 years. "We are proud of the momentum and customer demand for the Ford Focus around the world," Mark Truby, a company spokesman, said in an e-mailed statement. In addition to the Matrix, the calculation by IHS left out sales of Toyota's Auris, as the Corolla is known in Europe, and the Corolla Verso wagon that is sold in Japan, said Chris Hopson, a sales analyst for IHS. 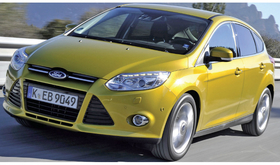 The researcher also excluded a Focus derivative, the C-Max wagon, from Ford's total, he said. Toyota sees the Corolla as still the world's most-popular car, with about 722,000 sales through July, said U.S. spokesman Mike Michels. "Corolla Verso, Auris and Matrix have been consistently recognized and reported as Corollas in sales results," Michels said in an e-mail. Toyota sold about 48,000 Auris models and 58,000 Corolla Versos in the first half, Hopson said. "In the world of lies, damn lies and statistics, I'm sure Toyota is thinking this is one of those instances," Hopson said in an interview. "The data we supplied to Ford was nameplate level only, just Focus to Corolla." Ford's European Focus sales were included in the count. The automaker introduced a redesigned version of the small car worldwide last year. "The Focus is attracting many new customers to the Ford brand for the very first time, particularly in Asia," Jim Farley, Ford's global marketing chief, said in a statement issued out of Thailand, where it was celebrating the production of the company's 350 millionth vehicle, a Focus. Ford is stepping up investments in Asia to tap demand from China to India after widening losses in Europe prompted the carmaker to cut its outlook in July for full-year profit. The company said this week it will bring its luxury Lincoln nameplate to China in the second half of 2014. Toyota, rebounding from the lost production caused by last year's earthquake and tsunami in Japan, has taken the global sales lead back from General Motors Co. in the first half. The Corolla was the leader in first-quarter sales, at 300,800, followed by Focus with 277,000 and the Toyota Prius hybrid at 247,230 with an expanding line, according to sales figures provided by the companies at the time. Toyota started selling a new version of the Corolla in Japan in May. The automaker said it is the most-popular passenger car ever with more than 39 million sold. Ford's F-Series full-size pickup line has been the best-selling truck in the U.S. for 35 years and the best-selling model line for 30 years. It includes versions such as the F-150, F-250 and F-350. While it would be difficult to quantify the value of being the top seller in a segment, it does help appeal to customers, said Ian Beavis, executive vice president of the global automotive group at Nielsen Holdings NV and a former sales and marketing executive at Ford, Kia Motors Corp. and Mitsubishi Motors Corp.
"People in focus groups do say they justify purchases because a vehicle is popular," Beavis said last week in an interview. "They like to belong to a successful group. It's a psychological issue, and it works in reverse, because people will be suspicious of models that aren't popular."